All members in The Knock Out® Family of Roses are self-cleaning so there is no need to deadhead. The Knock Out® Family of Roses will perform beautifully even without fertilizing. 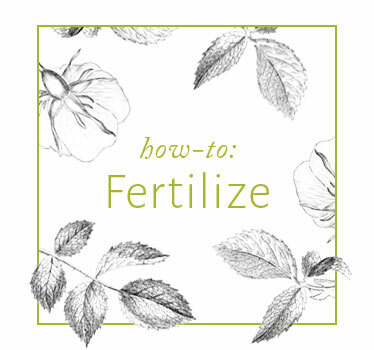 If you choose to give them an additional boost, it is very important not to fertilize until after the roses are established and go through one bloom cycle. Use a balanced fertilizer or fertilizer formulated for roses from your local garden center and apply after the first wave of flowering (be sure to follow the specified rates and method of application provided on the product label). Make sure the soil is moist before you fertilize to avoid burning the roots. Do not fertilize late in the summer as this is the time the rose should be preparing themselves for dormancy and you do not want to create additional unnecessary new growth that will likely die back from the first hard frost. The first wave of flowers will be abundant. Then the roses will typically have scattered blooms for the next five to six week period until another wave of heavy flowering occurs. This will repeat until the first hard frost. Yes, it is okay to transplant your roses. The best time to transplant is late winter or early spring while the plant is still dormant and before new growth begins to push out. Yes, it is fine to plant Knock Out® Roses in containers. If you decide to plant them in containers, transplant into a container 2 sizes larger than the size pot the plant was currently in to give it room to grow. Also, be sure to place the pot in a sunny location and keep them well watered. Depending on where you live, you'll probably need to bring them inside over the winter. Watch our planting video. We recommend you check your 10-day weather forecast, and if there is no threat of frost, then it should be safe to plant. In some very humid, black spot prone areas, you may see some black spot. Don't worry—while the plant may drop some leaves, it won't be detrimental to the overall health of the plant. Make sure when you water your roses, that you water at the base of the plant. Watering overhead (with a sprinkler or hose), leaves water on the foliage which is an invitation for fungal disease. Your Knock Out® Roses will be much happier if you water at the base of the plant. Also, they prefer a long drink of water every once in a while rather than frequent small watering. An application of horticultural oil should smother the spores and reduce spread of the problem. It is best to try this as soon as possible upon visible symptoms. An early sign of powdery mildew is a slight curling upwards of the foliage. You could try trimming back the worst affected areas and wait for new, clean growth to flush out. Voles are eating the roots of My Knock Out® Roses. What can I do? Pick each Beetle off and drop them into a bucket filled with warm soapy water. Putting a bird feeder nearby may also help. Japanese Beetles won't be detrimental to the overall health of the plant so if you can stand them, it's fine to leave them alone too. You may want to try a product like Milky Spores to control them—we recommend just pulling them off one by one though (not fun but effective). There are holes in the leaves of my Knock Out® Rose and I don’t see any beetles or other bugs. Any tips? The leaf damage you are seeing could be from what's called rose slug (also called sawfly). Look on the underside of the leaves. Do you see any tiny green inchworm looking critters? Rose slugs will chew the leaves of plants—leaving trails where they've munched through, but they won't be detrimental to the overall health of your Knock Out® Roses. Knock Out® Roses are not pest-resistant, but they are extremely tough so even if bugs get after them, they should be fine. You can use a spray product formulated for roses if the bugs are particularly bad in your area. The best way to remove Japanese Beetles is by hand though—pick them off one by one and put them in a container of warm soapy water. Placing a bird feeder nearby can also be effective! Knock Out® Roses are not deer resistant and unfortunately, as you probably know, when deer are hungry, they’ll munch on anything. Don't worry though, Knock Out® Roses are really tough. They bloom every 5-6 weeks so hopefully when it's time for them to bloom again, you will see more flowers. You may want to try a product like Liquid Fence to keep the deer away. If you live in a harsh winter climate, add 2-3" of mulch, leaves, or pine/fir boughs around the base of the plant. You may also want to wrap the plant with burlap. A heavy snow cover will also help insulate and protect the plant through the winter. In spring, remove any extra mulch that may be covering the plant too deeply and trim out any dead or broken canes, also remove any burlap that you may have used to wrap the plant. It’s getting cold outside...what do I do with my roses that are planted in containers? What about the Knock Out® tree roses? Tree roses will need even more protection. In areas where the temperatures fall below 10º F in winter, tree roses should be wrapped with insulating material to protect them from the cold and wind. In the colder areas where the temperatures fall below zero, the only adequate protection for tree roses is to lift them in late fall before very severe freezing weather and bury them in a trench covering them completely with a foot or more of earth. Knock Out® Roses can grow fairly large in some parts of the country if not cut back. Periodic trims will keep them maintained at a smaller size (on average 3-4' wide x 3-4' tall). A once a year cut (to about 12-18" above the ground) in early spring (after the last hard frost) is also recommended for maximum performance. There are only two fragrant Knock Out Roses®—The Sunny Knock Out® Rose and The White Knock Out® Rose. All of The Knock Out® Roses will produce hips sparingly. The leaves on my plant are turning yellow. Is there anything I can do? Did you get excessive/abnormal heat in your area? Sometimes a rose bush will turn yellow and drop its foliage in an effort to cool down. It may also be turning yellow because of too much water or fertilizing. The actual frequency of watering will depend on your soil and climate as well as the age of the plant. Try watering a few mornings a week - water slowly at the base of the plant, until the soil is wet 12 to 18" deep. Soaker hoses are helpful and prevent water from splashing onto foliage. You can also trim back the yellow leaves for a cleaner look.